Your dishwasher is a vital part of your kitchen, serving dirty plates to customers won’t be as forgivable as an overcooked Rump Steak. Limescale builds up in your machine can be detrimental to your businesses hygiene rating. To provide sanitation dishwashers reach a temperature of 82.2°c, limescale can build up around the heating element decreasing the machine performance and capability of achieving high temperatures for cleaning. Limescale build up will lead to mineral deposits forming on your plates. This will appear as a white film on your dishes. So how do we tackle it? One major factor that leads to a build-up of scale in your machine is down to the level of water hardness. Minerals such as calcium and magnesium are causing the creation of limescale when the water evaporates it leaves behind calcium carbonate deposits formed during the hot cycle. Depending on the county you live in, the hardness of the water will change dependant on the minerals in the water. If you wish to check the water hardness, we have a separate article with a map showing regional hardness click here. For areas with harder water, it’s recommended that a water softening system is installed, this removes the calcium, magnesium and any other ions from the water to leave pure fresh and clean water. 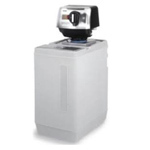 The water softener will also make your water more compatible with the soaps and detergents used in your dishwasher leading to a cleaner dishwasher and cleaner plates. 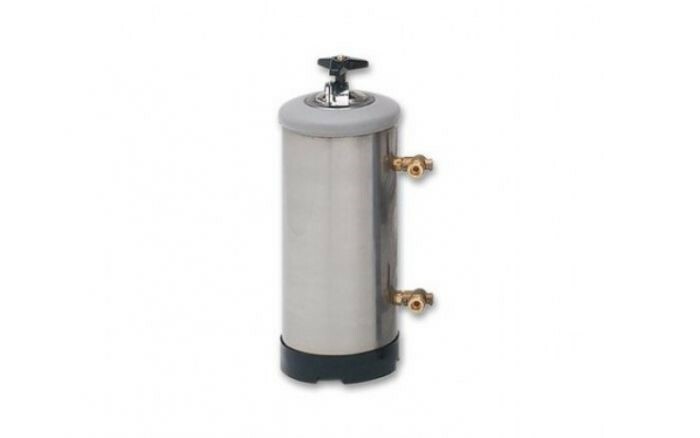 For more details on water softeners, click here. Other general maintenance practices can be carried out to ensure your machine does not get a build-up of limescale and the performance of your machine does not decrease. 1. Thoroughly clean out your dishwasher, this needs to be carried out daily. Drain the water from the machine. Then remove the spray arms and thoroughly clean all the nozzles, blocked water jets will reduce the cleaning efficiency of your machine. Before removing the filter, clean residual foreign matter from the bottom of the wash tank. Then clean the wash tank thoroughly, ensure that you do not use bleach or chlorine detergents as this can damage the machine, so use fresh water only. 2. The Filter must be check regularly; food particles can clog the flow of water, drainage will be hindered meaning water will become stagnated in your machine allowing the calcium carbonate minerals I the water to build up around the drainage. To prevent the possibility of food clogging your machine, implement pre-scrapping procedures ensuring employees remove all food from plates before placing them into the dishwasher. Ensure that the two lengths of clear plastic pipes included are fitted to the drain side of the taps. Turn both taps clockwise to 3 o’clock and ensure that the clear pipes are over a bucket or sink as minimal amounts of water under pressure may drain from the water softener. Unscrew the lid and add 0,5 to 2,5 Kg of granular salt (depending on the size of softener) into the top of the softener. Clean the lid and the seal from any salt residue. Put the lid back on and tighten it. Turn the top tap on the left. Let the salt water come out from the drain pipe until the water is fresh (around 40 minutes). 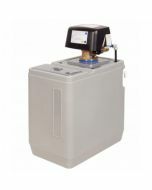 Put the water softener back in-service mode by turning the bottom tap back on the left. 4. Ensure the tank water is refilled every 20-30 wash cycles to avoid water sitting in the tank from the whole day cycle. When the water evaporates or is finally drained out all the hard water minerals will be left in the tank forming limescale. 5. If your machine is covered by limescale, you can clean it by using some descaler. Let your machine to fill and heat up, then put approximately 10oz of descaler into the machine and leave it for 1 hour. Then run few wash cycle, so it can clean all the jets and once done this, drain the machine out and flush it with fresh water. It’s recommended to repeat the same procedure one more time but this time without adding any descaler so that the machine can get rid of the descaler’s residues.